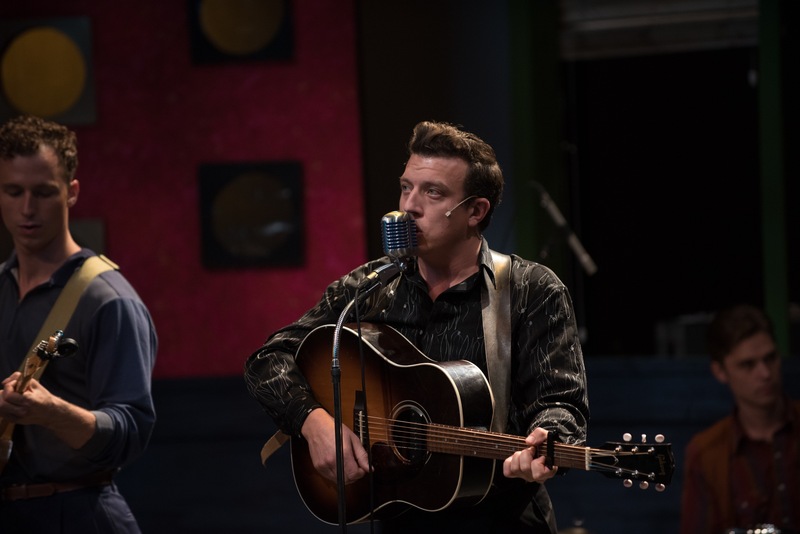 In a lot of ways, Million Dollar Quartet is a story about faith. Jerry Lee Lewis worries that playing rock will send him to hell; Carl Perkins struggles to believe in himself and revive his career; Johnny Cash feels badly about betraying the good faith of his mentor; and Elvis Presley wonders whether or not his move to another record label was the right choice. But it’s Sam Phillips who summarizes true faith in Quartet. In a stunning monologue near the end of the play, the record producer speaks about the belief he has in his artists and their work. “This is where the soul of a man never dies,” he says. Million Dollar Quartet is set on December 4, 1956, a night where Lewis, Perkins, Cash, and Presley all gathered at Sam Phillips’ Sun Records to play together. Phillips has to decide whether or not to sell Sun Records to Elvis’ label, RCA. The crux of the show’s drama hinges on Phillips’ ongoing monologue to the crowd, explaining his reluctance give up mentoring upcoming artists. As Phillips, Danny Johnson renders a slick salesman vibe while also affecting heartbreaking vulnerability. He is every inch the Southern hustler, but his hard work for his artists is unflagging. Though the cast looked a little stiff during their first number, “Blue Suede Shoes,” any hint of nerves were completely gone by the second act. The actors ease confidently into embodying their roles. Grant Landry explores the tense, self-conscious portrayal of a conflicted Perkins; Jonas Shandel does Cash brooding justice; Michael Vanhevel nails Presley’s wobbling hips and trademark sneer; and Calvin Laveck brings manic, comedic energy to Lewis. Eden Richmond makes a sultry, stabilizing addition as Presley’s girlfriend Dyanne. Close your eyes at any point and you’d swear the legends themselves were actually performing for you as they knock out “Great Balls of Fire,” “Walk the Line,” or “Hound Dog.” The performers drew three standing ovations on opening night, and an awed gasp as they perfectly imitated the famous photo taken during the recording session. Quartet gives a glimpse into a pivotal moment in rock history, where legendary rock heroes are giving themselves over to faith in what lies beyond. Sure, it’s about big decisions, but the artists spend the night bonding over what brought them together in the first place: their mentor, and love of good music. “Rock’n’roll ain’t a fad, it’s a damn revolution,” Phillips cries. The audience has the benefit of knowing everything will turn out alright, but we’re reminded that at this moment in time, nobody knew how anything would turn out. All that’s left for them is to take the leap. Million Dollar Quartet opened on September 12 and has been held over until October 8, visit magnus.on.ca for details.